Rubery RBL have three more games to play in the Kings Norton League but need two more wins to secure the title as second placed Avenue Social with 40 points are just two points shy of Rubery with two more remaining fixtures. John O’Sullivan had a mixed bag of results in week two of the Shirley Premier League as he began the night with a 3-1 win over Kevin Graver then lost by the same margin to Mark Gwalchmai and then finished the evening in a 2-2 draw with Gary Cleverley to put him on 14 points from five games. As a result of his indifferent results O’Sullivan loses the top spot and drops to third place level on points with new leader Mark Henderson who added a 4-0 win over Chris Thomas snr and 3-1 success against Steve Harper to his account to take his 100% record to four games. Phil Thomas moves up three places to second following his 4-0 wins over Mark Cater and Trevor Carter just one win short of Henderson but on the same 14 points. 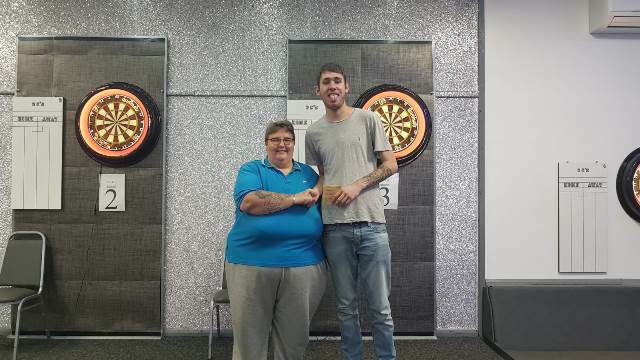 Tom Bent opened his account this week with three wins over Karl Wilson (4-0), Steve Harper (3-1) and Leigh Clutterbuck (3-1) to put him on ten points from the three games. The only other player with a 100% win record besides Henderson and Bent is Pete Silver who had 3-1 wins against Sean Talbot and Antony Daly to give him nine points. The C’s Club Double Top League are up to week four and only four of the starting line-up of thirty two players have won all of their games. Luis Barberan added 3-0 wins over Pete Kingdon and Lee Walker to his tally to keep him top of the table on 24 points from 9 games with second placed Neil Parsonage just three points behind him after his wins over Chris Millward (2-1) in which he hit two maximums and Courtney Burns (3-0) giving him 21 points from eight games. Third in the table Tom White didn’t play this week and although he is six points short of Barberan he has three games in hand which could net him nine points. At the other end of the table it was a good week for Jamie Carter as after his first six games he was without a win but two 3-0 wins against Steve Beale and Ryan Beale have taken him off the foot of the table and up nine places. 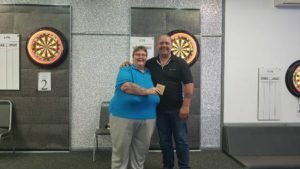 The C’s Club was also the setting for a Bank Holiday Knockout and as in the Double Top League the home board proved to be once again Luis Barberan’s lucky board, as he went on to win the knockout. In the quarter finals Barberan had a straight 3-0 win over Glen James and booked his final place with a 4-1 success against Richard Mills. From the other side of the draw Andy Hutchings reached the final with a 3-1 win in the last eight against Terry Webster and a 4-1 win in the semis over Jake Webster. With a maximum and a thirteen darts leg, Barberan won the final 5-0. In the first round losers Plate Competition Neil Parsonage took the honours with a final straight 3-0 win over Steve Whatmore. Parsonage won his last four game against Lee Walker 2-1 while Whatmore won 2-1 against Dan Stone. Jordan Ward currently tops the Winmau Centre Thursday Night Champions League with 96 points from 20 games the latest of which saw him win 7-0 against Adam Clifford and 5-2 against Ashok Sehdev. Ward’s nearest threat comes from second placed Mick Baker who is not only the current reigning champion but also champion for the last four seasons. Baker is on the same 96 points as Ward but with three games in hand his most recent fixtures seeing him win 5-2 against Chris Fox and Andy Vellender then round off the evening’s games with a 7-0 victory over Martin East to keep him well on course for his fifth consecutive title. The Forest of Arden Summer League had the preliminary round of their Knockout Cup on the fixture card which didn’t produce any surprise results as Dunky’s Boys beat The Crown 6-3, Greville Arrows won 5-4 against Ivy Leaf and with the biggest win of the round New Inns defeated Chelmsley Town 8-1. Highwood Arms had a bye. The Untouchables have taken over pole position in the Winmau Centre Monday Night League following their 43-5 win against Unleashed Warrior. Untouchables win has taken their point tally to 562 with a narrow six point’s advantage over second placed Above Average whose fixture with third placed Misfits was cancelled, Misfits being a further 20 points adrift of the leaders. Biggest win of the week went to fourth in the table Bloody Good Shot Sir! Who chalked up a huge 46-2 win over bottom of the table Three Men And A Lady. The Sheldon and District Winter League staged the finals of their Sheldon Shield in which both of the semi-finals finished with 5-4 scorelines as Maggies defeated Sheldon Marlborough and Crown Arrows won against Langley Hall Sports and Social Flights. The final also had a close 5-4 result which went in favour of Maggies with Crown Arrows runners up. The Sutton and District Summer League played a couple of rearranged division one fixtures and the first round of their Prestridge Shield and Roy Bird Shield. The league games brought together the top two teams in division one with second in the table Erdington Club losing their home tie, their first defeat of the season, 6-3 against the divisional leaders The Boat, who now have a two point’s buffer at the top of the table over both their opponents and third placed Golden Hind. The other game played saw the two bottom teams square up to each other with Red Lion who are at the foot of the table losing out 6-3 to Oscott Social who move up two places from their previous next to bottom position. 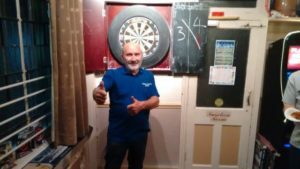 In the Prestridge Shield Drakes Drum had a 5-4 win at Old Oscott WMC while in the Roy Bird Shield Old Oscott Arrows handed out a 9-0 whitewash to their hosts Sutton Sports. The Small Heath League had their Doubles Knockout on the agenda and taking the title with a close 2-1 final win over C.Wyatt and N.Davis (East Birmingham Allotment Holders Association) were team mates T.White and L.Robinson. White and Robinson won their semi-final game against S.McCormack and G.McCormack (Heartlands Club) 2-1 and Wyatt and Davis beat Jim Frost and S.Cain, also from Heartlands Club, 2-0. With the end of the season now in sight the league will be holding their AGM to form the new season on Sunday 29th July at the Emerald Club, Green Lane, B9 5DH beginning at 11.00am, all teams both old and new are cordially invited to attend or should youi require any further information contact league secretary Alan Cheshire on 07914-716779. On Friday 8th June the Sheldon Marlborough Cricket Club will be the setting for the John Young Memorial Singles Knockout with the eventual winner receiving the JY Memorial Trophy. All proceeds from the event will go to Bowel Cancer UK and the Dogs Trust. The Camp Hill League have got their new season underway and the early pacesetters with a 6-1 win over Devil’s Club are Sheldon Marlborough Flights. Sheldon are closely followed by reigning champions Journeys End Lions who had a 5-2 win away to White Swan Nomads while Wagon and Horses and Tyseley WMC in turn won 4-3 against Station Wagon and North Star. The Netherton Thursday Night League played their doubles knockout down to the quarter finals stage and winning through were A.Cowley & C.Hadlington (White Horse), M.Ferney & A.Ghaley, A.Dubberley & D.Ferney, S.Purcell & J.Bunn (Riddins Tavern), S.Russell & N.Cartwright, S.Phipps & C.Tomes (Delph Bell), A.Dimmock & C.Bowen (Bulls Head), R.Carr & D.Brown (Dudley Ex Serviceman’s Club). A final win over Alan Carter (Old Liberal House) gave Duncan Campbell (Progressive Club) the Pip Club League’s division one singles title. Losing out in the semi-finals were Cliff O’Connor (Wigginton Arms) and Mark McCloughlin (Red Lion). With just one more week’s fixtures to play in the Sedgley and Gornal Tuesday Night League the top two teams Parkes Hall and Old Bulls Head are still battling it out for the title. A 7-2 win over Five Ways keeps Parkes Hall top of the table with 54 and an 8-1 success for Old Bulls Head at Gornal British Legion leaves them just two points and an inferior average adrift of Parkes, so a win for Parkes Hall in the final game would assure them of the title and it would take a very heavy defeat for them plus a big win for Old Bulls Head for that not to happen. The Hilltop Friendly Tuesday Night League played their singles knockout down to the last sixteen and the fifteen named players so far making the finals were 13 years old Cameron Gill, Jay Stevens, Phil Arnold, Mark Zambra, George Roper, Jason Ingram, Lamba Gill, George Arnold, Ant Pitts, Harrison Blewitt, Paul Bladen, Roop Bowen, Matt Wall, Steve Cliff and Wayne Griffiths. A local derby between Netherton Cricket Club ‘A’ and Netherton Cricket Club ‘B’ saw the ‘A’ team win 7-2 to maintain their second place in the Cradley Tuesday Night League table four points behind leaders Brickmakers Arms who had a 6-3 home win over Roost. Third and fourth placed Wheatsheaf and Bulls Head are both on 16 points, six adrift of Brickmakers after Wheatsheaf won 6-3 at White Horse and Bulls Head beat Riddins Tavern 5-4. 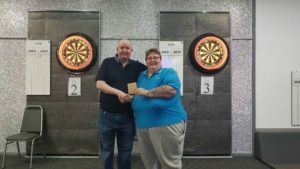 The division two doubles section of the Wolverhampton Tuesday Night League saw more movement in the league table than any of the other three divisions. Former leaders Village Inn lost 3-0 away to Penn Bowling who move up from third to top the table with 14 points, Village Inn dropping down to fourth place on 12 points and trailing on average behind Royal, Albrighton whose 3-0 win over Pendulum takes them from fourth to second and Woodfield Social who had a 2-1 win at County to lift them up two places to third, County, now in fifth place are on the same 12 points as the three teams above them. Due to Whitmore Reans WMC having a bye in the Tettenhall Wednesday Night League they have been replaced at the top of the table by ECC ‘A’ who won 5-2 at Swan Compton, the win giving them a total of 18 points, two more than Whitmore who are now in second place with a game in hand. Pilot, with a 4-3 win away to Royal, Albrighton move up three places off the foot of the table, this being only their second win in ten games. A 6-1 defeat at Moreton has seen Emerald replace Pilot at the foot of the table.